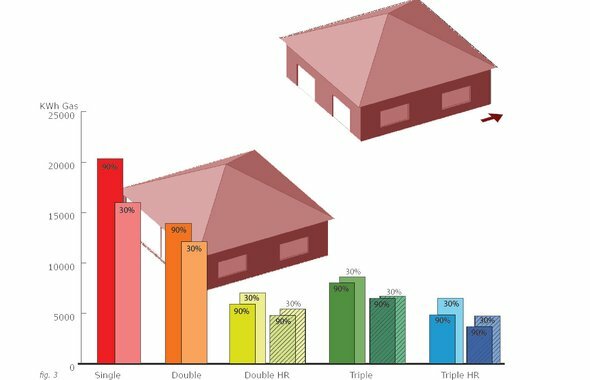 Except Integrated Sustainability | Energy and cost analysis double and triple glazing - Is better insulation always better? Article > Is better insulation always better? The energetic performance is measured using computer analysis software, which also gives us our usage cost. Using life cycle analysis data a comparison is made concerning the environmental costs of the product itself, and a quick cost comparison shows the financial benefits and drawbacks between products. "In western society buildings can be responsible for more than 30% of the national energy usage and greenhouse gas emissions. In the search for solutions to combat these issues and reach the targets of policy agreements, new building materials and construction methods are introduced frequently, as is the case with triple glazing. In recent years there are movements to make the use of triple glazing mandatory through building codes or performance standards in the Netherlands, instead of double glazing. There are many studies done on triple glazing, but none to compare the actual energy costs and benefits for various comparative products for the Dutch climate. Therefore Except has initiated a small research project using energy analysis software, basic cost calculations, LCA data and recommendations from the industry to review the consequences and characteristics of triple glazing versus double glazing." Download the analysis report below.